Oh Mother! 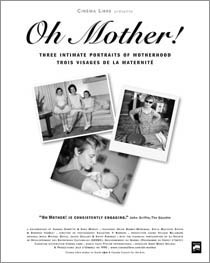 takes a strikingly intimate look at the lives of three generations of mothers. In separate profiles, Helen Bambic Workman, Katja MacLeod Kessin and Deborah VanSlet share private stories, impressions, memories and good old fashioned wives' tales that take us straight to the bosom of motherhood. Helen became a mother in the 1950s. Like many women of her generation, she believed that motherhood would lead to absolute personal fulfilment. When it didn't, she began to make changes. She wanted to be seen as "Helen" and not "Mom". Now in her sixties, Helen speaks candidly about her four children, her mother, and her sense of autonomy. When Katja became a mother in the 1970s, she was just a kid herself. With three children now in their teens, this self-proclaimed "artist at survival" recounts a life spent balancing childcare with the development of her artwork. She emerges as an artist whose paintings engage with life in the domestic sphere. When Erica fulfilled a lifelong desire to have a child, her partner Deborah became a mother too. This 90s portrait of planned parenthood shows how two women distinguish their roles as "Mom" through their different approaches to and investments in parenting. Oh Mother! raises the curtain on the domestic scene to discover the unique voices of Helen, Katja and Deborah. Their stories challenge prevailing myths and ideals - painting three dynamic portraits of motherhood.